Like the rainbow trout of Montana, the brown trout are all wild fish that were introduced generations ago and they are doing quite well on all of our rivers and streams. Montana Brown trout, like the native bull trout and non-native brook trout, spawn in the fall so they remain in the big rivers throughout the spring. High water, big streamers, and big carnivorous brown trout come together in the late spring for potential at truly trophy sized brown trout. Being the aggressive predators that they are, brown trout’s presence makes throwing a streamer a really good option throughout the season. Working the deep holes and cut banks where trophy brown trout lurk, especially in the late evening with streamers is a great tactic and can produce fantastic fishing! Brown trout are very opportunistic feeders and as a result a lot of big browns are caught on dry flies. Maybe it’s the huge size of the stone fly and hopper patterns that evoke such tremendous strikes, but it’s always a possibility to have a 20”+ brown trout crush a hopper or golden stone right on the bank in very shallow water. Whatever the reason, it sure is spectacular watching it happen! 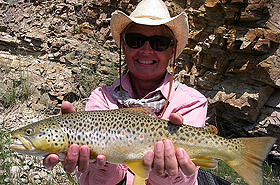 The average size of brown trout is also a little larger than other trout here in Montana, with fish averaging 16”-20” on all the big rivers. You will encounter more small brown trout fly fishing Rock Creek, so the average there is probably 12”-18”, with the occasional 20”+ fish.